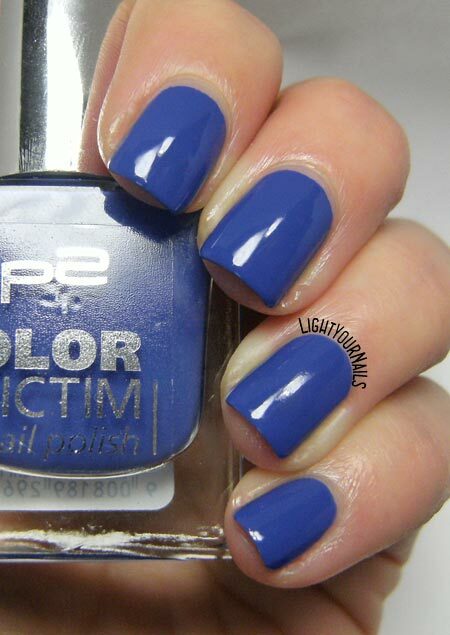 P2 Color Victim 628 High Five | Light Your Nails! Today I’m showing you swatches of a nail polish by Austrian brand P2 Cosmetics. This pretty medium blue is no. 628 in the Color Victim collection and it’s called High Five. Application is very easy and it’s a very pigmented colour. You have a perfect opacity at first coat already. Drying time is quite quick as well. Only flaw I could find in P2 High Five is it doesn’t dry to a very glossy finish at all. You definitely need a top coat for that extra smoothness and glossiness. Oggi vi mostro uno smalto del brand austriaco P2 Cosmetics, che in Italia si trova da OVS e Upim. Questo bel blu medio è il n. 628 della linea Color Victim e porta il nome di High Five. La stesura è semplice e lo smalto molto pigmentato, per cui alla prima passata si ha già un bel colore uniforme. Anche l’asciugatura è rapida. L’unica nota dolente, se tale si può considerare, è che non asciuga molto lucido quindi necessita senza dubbio di un bel top coat che uniformi e dia brillantezza. I love this shade, not too dark and not too light either. Application is such a dream I can’t reiterate that enough. I can totally confirm this keeps being my favourite line/collection among the ones sold by P2 Cosmetics. The products are really good for such a cheap price tag. Have you ever tried any P2 nail polish? From which of their lines? And did you like them? Il colore mi piace moltissimo, nè troppo scuro, nè troppo chiaro. La stesura così semplice, poi, non fa che confermarmi ancora una volta che la Color Victim è la mia linea preferita tra quelle offerte da P2 Cosmetics. Davvero prodotti validi per un prezzo decisamente economico. Avete già provato smalti P2 Cosmetics? Di quale linea? E come vi siete trovati? Anche io amo il blu in tutte le sue tonalità! ...un bellissimo punto di blu!!! I know the feeling Marisa, believe me! Never heard of this brand but it's a very prett shade. Thank you! P2 Cosmetics is very popular in Europe but I think it's not sold overseas yet. It looks so beautifully smooth! Great blue! Not drying glossy doesn't bother me at all. I can't wear a manicure without a top coat whether it be a glossy or matte top coat. That totally makese sense! I must admit sometimes I do not wear a top coat. I like these kind of dusty blues! It's not the usual shade of blue and that's why I like it!